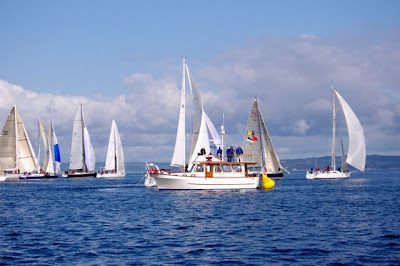 On April 30 we participated in the 2011 running of the Seattle Yacht Club Protection Island Race facing off against most of the other big in the Seattle area. We had a nerve-racking downwind start in close quarters, narrowly missing and being missed by other boats. 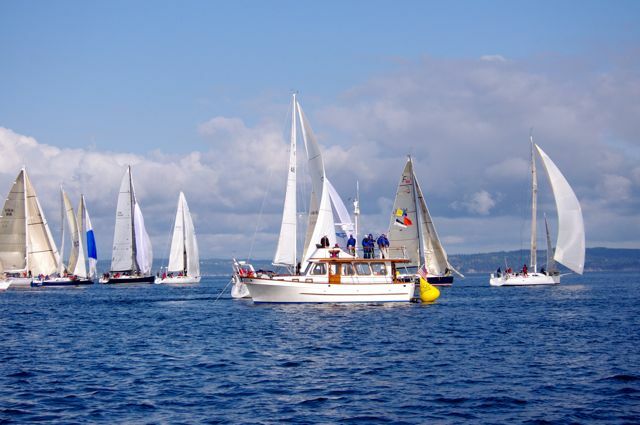 We immediately set out spinnaker and setup for a low and slow middle lane to Point No Point. Dark Star and later Flash took our lane, while Wasabi, the Car and the rest took the high lane to run the shore down to Point No Point. We made some pretty big gains until the wind started to shut off when the boats that went down the west side totally hammered us. In the end we were the first to tuck in north of Double Bluff with a nice comfortable lead. From Double Bluff we worked the Whidbey Island shore and at Bush Point crossed over to Marrowstone and worked that side. Immediately after rounding Marrowstone in light air we headed deep into the bay at Port Townsend to stay out of the current. We managed to round Pt. Wilson before Dark Star reached Marrowstone, further consolidating our lead. Unfortunately after rounding Pt. Wilson and working the beach the wind completely shut off and we were left drifting forward at ~1.0 knots for hours while watching the rest of the fleet sail up to us -- UGH! Eventually a hint of a westerly filled in and we were back to sailing putting some time on the fleet. After a nice rounding of Protection Island we were back into little breeze while the rest of the fleet started to catch up again. We managed to find little pockets of wind in what looked like a building westerly -- in doing so we rounded Pt. Wilson and put up our A2 in the building westerly. We essentially repeated out course back to Seattle, except after rounding Pt Wilson we immediately crossed back over to Bush Point and worked the Whidbey Island side. At Double Bluff we crossed over to Skunk Bay and rounded Point No Point under spinnaker. We could see the wind building behind and tried to keep rumbling. We ended up getting the gun after 14:22:37 and took first place by about 7 minutes over Flash -- a nice surprise after a long day on the water.